It’s the middle of June… you’re in Sevilla (that’s in Spain for the geographically challenged)… your lovely travel companion and yourself have just decided to go your separate ways… and you’re kind of stuck with a rental car until June 30th… what do you do? 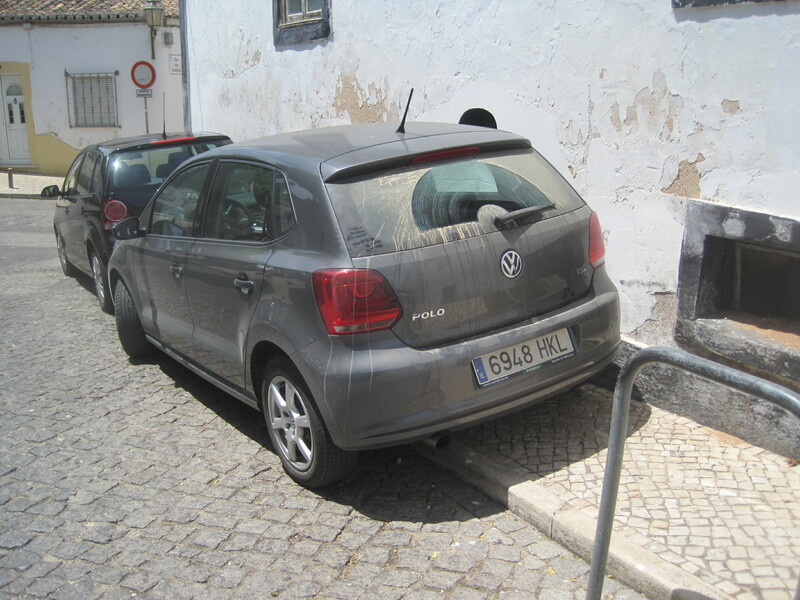 Well, if you’re me… you decide to go to Lagos Portugal to learn how to surf. Yes… I can hear you all now loud and clear… so I’ll just come right out and say it: Hello, my name is Richard… I am from San Diego California and no, I don’t know how to surf. I don’t know how it happened really…I could run through a litany of excuses like… I grew up inland and didn’t live near the beach (yet I have friends who grew up in the same town as me that know how to surf)… or, I was busy doing all sorts of other ridiculously awesome activities so I didn’t even have the time to learn to surf (I wasn’t, there were summers in high school where I went to the beach nearly everyday)… or I could blame my parents (the ultimate cop out… Mom and Dad you did good and this could be no one’s fault but mine). Well… surfing is something I’ve kind of always wanted to do… so better late than never right? Plus…wouldn’t it be weird for me to learn to surf back in California? People would think what’s wrong with this guy… shouldn’t he know how to surf already if he’s from Southern California? And they’d be right… so if I learn to surf somewhere else… I could just slip back into California and start surfing like it was no big deal and I’d always done it… weirdness avoided. 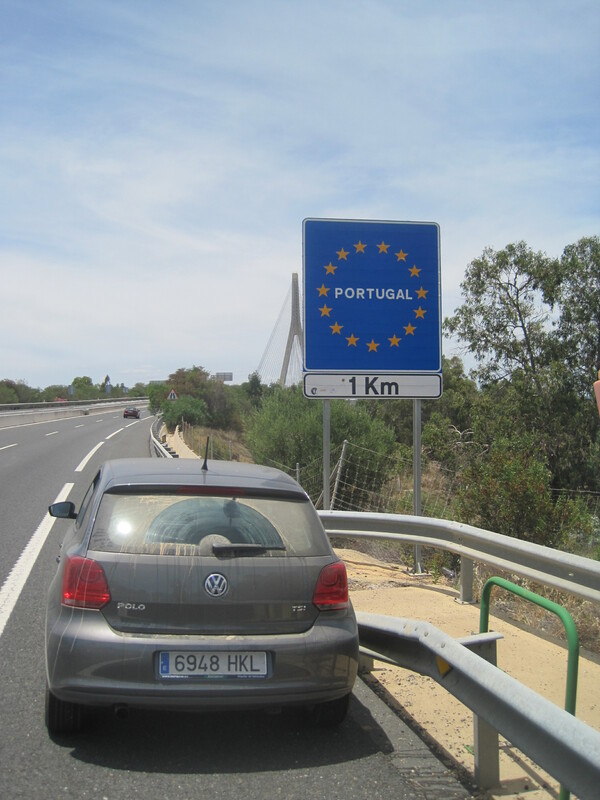 So to recap… My idea was to drive to Southern Portugal from Seville, learn to surf for about 2 and half weeks, and then drive back to Spain to return my rental car and do something else. Done and done… off to Portugal I went. Why Portugal you might ask… well it just so happens that Lagos has been rated one of the top places in the world for beginners to learn to surf. I grabbed a bite to eat and started walking around to get the lay of land and to find a place to stay (it’s only about 3 PM at this point). I work my way towards the main plaza and see some blonde people at a table eating lunch (clearly not Portuguese or Spanish… not that they can’t be blond… it was more a style thing)… I go a bit closer and hear some English so I walk up and say hello… Aussies… that works. They give me a quick rundown of where most of the hostels and tourist apartments, are and I thank them and head out. As I make my way across town (and this is not a big town fyi) I keep hearing more Aussie accents (yes… they might be New Zealanders, but I really can’t tell the difference between them unless they’re actually both being spoken to me at the same time… sorry kiwis… I know that you don’t like being confused with Aussies… but you’ll probably just have to get over that at some point). 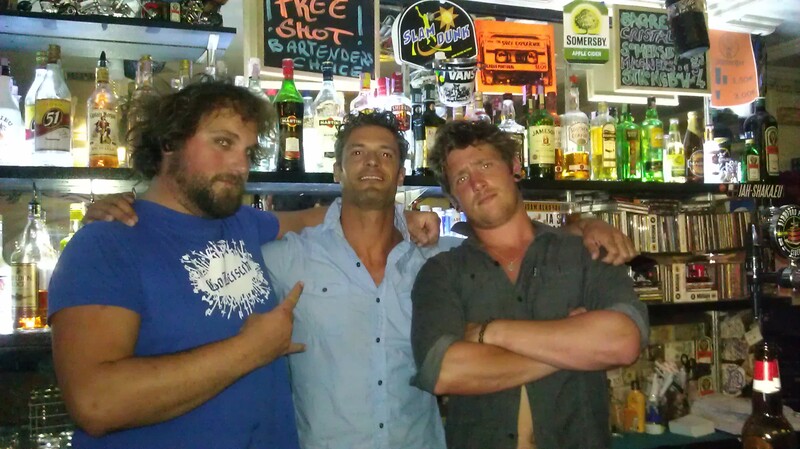 I pop into a hostel to check it out… more Aussies. I go to the another… more Aussies. I finally pick one and get a bed… nearly everyone in my hostel is Australian. This is a bit odd, but I’m willing to deal with it as it’s nice to be around a lot of native English speakers for a change after some time in Spain. I’ll wait and see what it’s like when I head out at night… so after dinner some folks from the hostel and myself head out and guess what? Yep… you got that right… more Aussies. Literally… Lagos Portugal was like 85% Australians… generally (but not all) of backpacking age… and all on the same tour de Portugal and Spain (everyone I spoke to was either going to, or coming from Lisbon, or going to/coming from southern Spain). It’s like the Australian Tourism Board has put out some kind of advertising blast that compels every young Aussie to go on this particular Spain/Portugal circuit and spend at least three nights in Lagos. It was actually kind of ridiculously funny and strangely weird all at the same time. 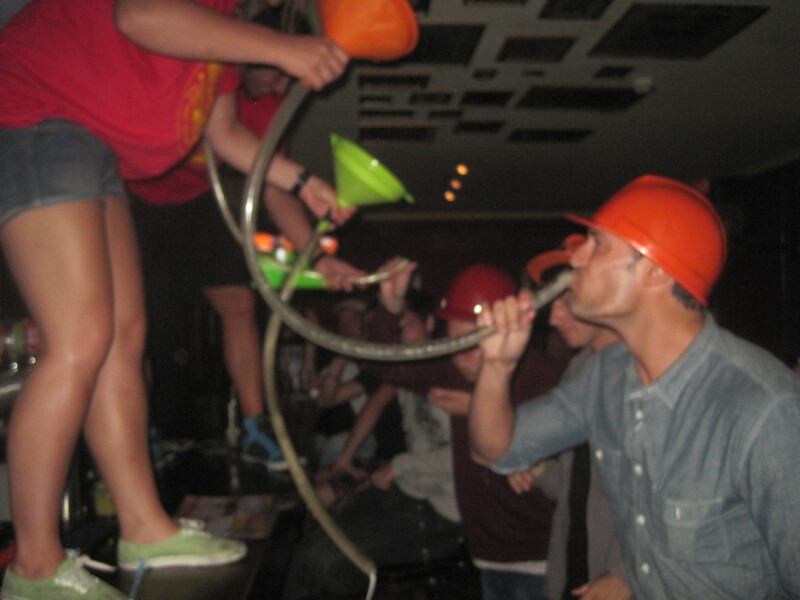 Safety first when crushing beer bongs with your Aussie hostel mates at the bar. This bar actually had a tally on the wall, by country, for beer bongs downed… chalk up three for America (and for the record one of my Aussie friends here threw up after two). My favorite bartenders at my local bar (i.e. the one right across the street from the flat I rented). 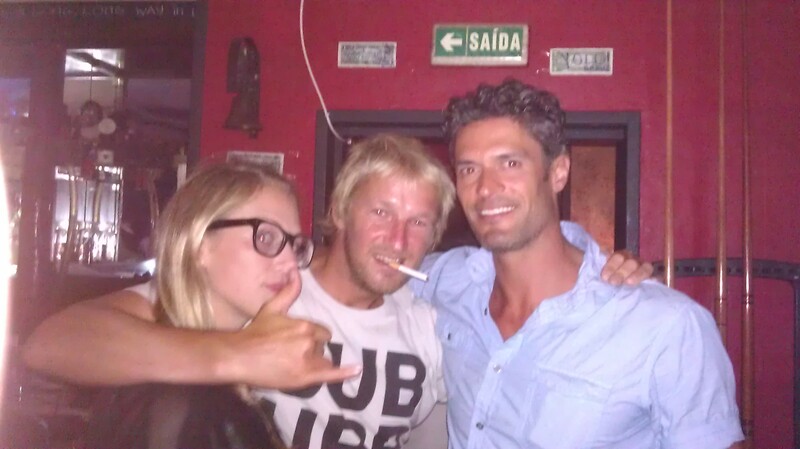 My flatmates and surfing buddies… and yes, you can still smoke in bars in Portugal (or at least in mini-Australia, aka Lagos). 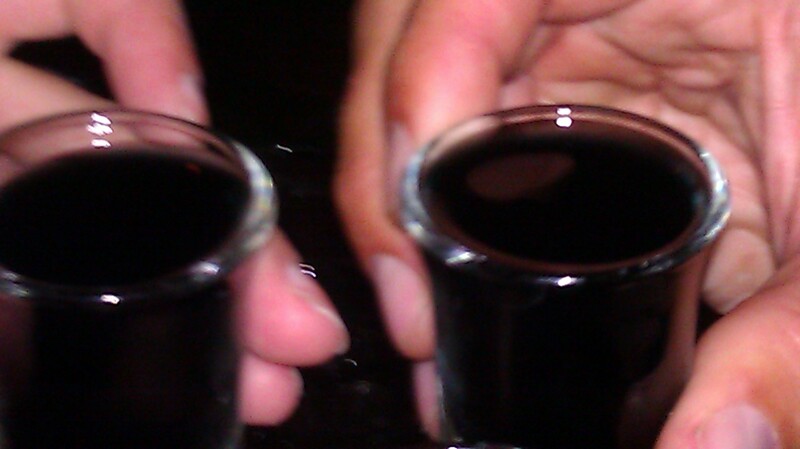 Portuguese black vodka… I drank way too much of this stuff. Surprisingly good. Lagos proved to be an interesting time for me… I was there on a mission to learn to surf, but there was this constant stream of nightlife to tempt one into staying up all night (and staying up all night equals not getting much surfing done the next day – and even though every night was the same in Lagos there was constant stream of new people rolling through on the Aussie tour de Portugal/Spain circuit). So it was tough to find a balance between accomplishing my goals and having fun… very tough. And honestly, after Ibiza, even though Lagos is supposed to be this big party mecca, the nightlife was actually pretty boring (it’s all relative cause the Lagos nightlife is blasting off if you’re a backpacker there for three nights… by the fourth night you’re over it). Maybe I’m just more of a club person than a bar person (I do find it weird to say that)? After my first three nights in the hostel, I found a room in amazing flat through some surfing buddies (ridiculously good location, really good people and cheaper than my hostel bed) where I ended up stayed through the end of June. So I spent the rest of my time in Lagos in a constant mental struggle between having this really great place to stay, with a good core group of people/friends (via the flat, surfing and locals), and getting some good surfing time in… but not really feeling the vibe of the town itself. The guy renting me the room offered to cut me a great deal to stay through July, and I even got the rental car company to cheaply (relatively) extend my car rental another month (necessary because the surfing beaches are about 30 minutes away from Lagos itself)… but in the end (with some good advice from a Mr. Shayne Fitz-Coy) I decided to move on. I just wasn’t ready to settle in one place for that long of a time, and I still wasn’t enjoying the town that much… so back to Spain it was… dropping the rental car off in Seville and catching the train the next day to Madrid. Obviously it’s easier to go from Spain to Portugal than from California to Arizona, because there is a border stop leaving and entering California. Ha ha… I was wondering if there was a checkpoint or not… I couldn’t remember. Maybe as easy as driving from Massachusetts to Connecticut. Hey, came across your blog when I was looking for information on Lagos, I am planning to go and work there for the summer, I know its been a long time but do you remember the details of that apartment you rented by any chance? Or how did you find out the details for the place, Id really appreciate it if you could get back to me! Thanks 🙂 Aisling. I found the apartment through one guy I’d been surfing with… friends of friends type thing. I think if you show up a bit early and ask around you’ll be able to find something. Sorry I can’t be more of a help than that. Have fun.